Engineering professor Yoram Cohen addresses well-wishers who came to see a mobile treatment plant that's designed to purify agricultural runoff and groundwater in rural and sparsely populated areas. A rolling water treatment plant designed by UCLA researchers made a pit stop on campus this week before heading north to the San Joaquin Valley, where it will help address California’s inadequate water supply. 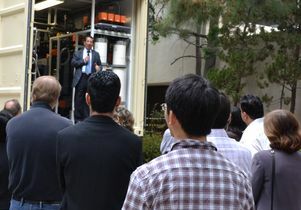 The technology was developed by Yoram Cohen, a professor of chemical and biomolecular engineering at the UCLA Henry Samueli School of Engineering and Applied Science and director of the UCLA Water Technology Research Center, and Anditya Rahardianto, assistant researcher in UCLA's Department of Chemical and Biomolecular Engineering and the Institute of the Environment and Sustainability. Engineering Dean Vijay Dhir gets a tour of the mobile plant from professor Yoram Cohen. 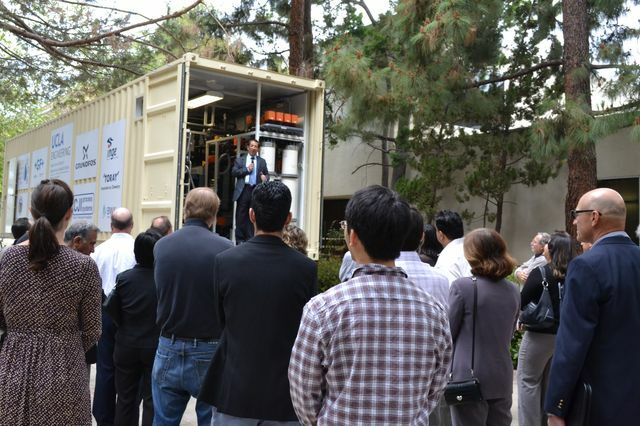 The plant, called the Smart Integrated Membrane System – Brackish Water (SIMS-BW), is a demonstration-scale field lab designed to test purification and desalination technologies developed at UCLA. The unit contains pre-treatment and reverse-osmosis filtration systems for groundwater and agricultural runoff, and can turn 10 gallons of water high in salt and pollutants into 8.5 gallons of drinkable water. Cohen emphasized that the system can be operated remotely by computer, tablet or smartphone, an important factor since the goal is to provide high-quality water in rural and sparsely populated areas. 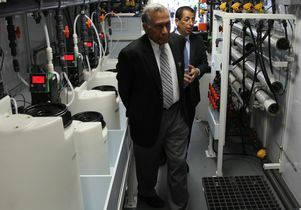 On Wednesday morning, Cohen and UCLA Engineering Dean Vijay K. Dhir welcomed officials from state and federal water agencies, as well as industry partners on the project, to inaugurate the plant. Dhir pointed out that UCLA Engineering, the birthplace of the Internet, developed the first reverse-osmosis desalination technology more than 50 years ago. “Professor Cohen has married the two technologies,” Dhir said. Next stop for the mobile water treatment plant: farmland in the Panoche Drainage District near Firebaugh, California, west of Fresno. Panoche is one of five rural water districts, together with the California Department of Water Resources, supporting the project. The U.S. Bureau of Reclamation provided significant funding for the plant. Companies that provided equipment or support for the SIMS-BW include Georg Fischer, Grundfos Pumps Corp., CJI Process Systems, Inge Watertechnologies, Toray Membrane USA and BWA Water Additives. Panagiotis Christofides, a professor in UCLA’s Department of Chemical and Biomolecular Engineering, Ph.D. student Larry Gao and others also worked on the project. Rahardianto said it will spend at least three months in the Panoche Drainage District and then move around the San Joaquin Valley as a lab on the go, operating with a variety of source water conditions.